When browsing the fragrance section of ETRO’s website, one is greeted by a series of beautiful watercolours, each one depicting a bottle of perfume filled with sweeps and strokes of vivid, melting colours, showcasing fragrances that appear to move and as if they are alive. It’s easy to get lost in these pictures and one can spend more than a few minutes moving from scent to scent to see how each fragrance is depicted in colour and shape. By far the most eye-catching is the illustration for Shantung, ETRO’s latest fragrance, which appears as a bottle filled with green, pink, yellow and blue flourishes, creating the image of grasses and flowers reaching slowly to the sky. It’s beautiful. Shantung takes its title from the silk fabric of the same name and its scent is evocative of a bright, endless dawn. ETRO describe it as an “olfactory score” that “cameos the stories woven by wild silk and the nomadic tribes of an ancient time” all packed within an ultra modern fragrance that is evocative of the most pleasant of days. Like ETRO’s fashions, Shantung is a contemporary piece made using classic materials to create a modern design that is unmistakably Italian and refined. Did I mention that it’s beautiful, already? 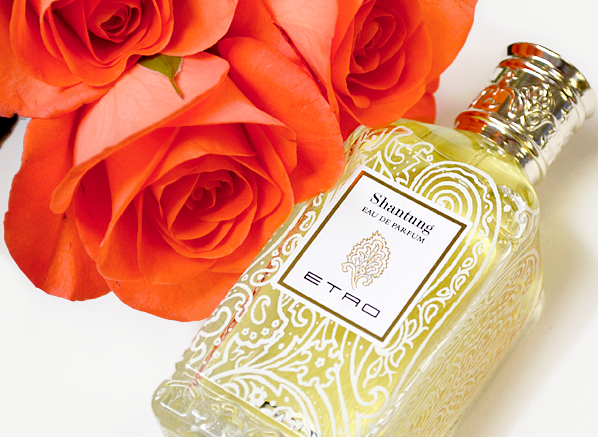 The first spritz of Shantung is like a wave of summer. It comes drifting out of the bottle with a mauve cloud of fresh blackcurrant that is humid and dewy, but also warm and fluffy. The sparkle of mandarin and lychee adds an aqueous shimmer to the cloud, giving the impression of heavy raindrops elongating off the cloud like juicy pears hanging from a branch. The whole thing smells delightfully soft and fizzy, like bees flying around a vast meadow of perfectly ripe flowers and fruits, all of which are paying worship to the warmth and sustenance of the sun. In the heart, Shantung presents an homage to the kissing cousins of peony and rose, taking the sharp crunchiness of the former and pairing it with the sweet, powdery quality of the latter to create a more full-bodied fragrance at the core. Unlike many fragrances that showcase bold flowers such as rose, Shantung is not an essay to any one given bloom, instead it is a landscape of flora, boasting a seamless blend of botanicals that has a wonderful range of textures that span from hot skin to crimson-coloured velvet and on to fleshy petals. The floralcy is palpable at every turn. Shantung is an impossibly pretty scent. It’s so light, airy and delicate that it feels like soft linens blowing gently in the breeze. 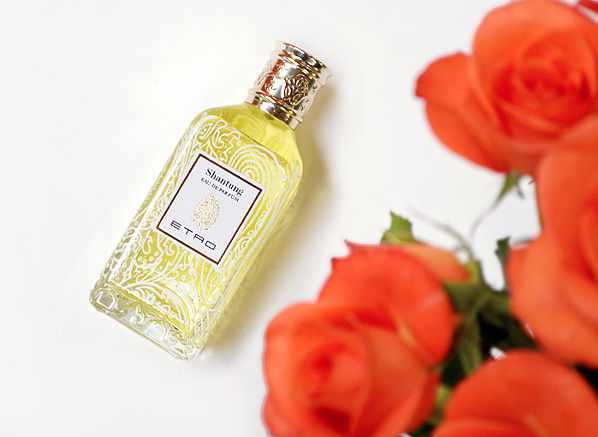 It’s a summer fragrance that speaks of bright, sunny days spent doing nothing but appreciating the beauty of nature. It’s colourful and vibrant but its hues are pastel shades rather than vivid tones and wearing it feels like a dream of nature’s most active seasons. Shantung is an iridescent silk fabric of many colours, each of which appears as the light catches it from different angles. Shantung is cherry blossom pink, it is chartreuse, phlox and goldenrod. It’s a plethora of shapes, shades and textures, and it’s a pure and utter delight. This entry was posted on Wednesday, June 1st, 2016 at 5:43 pm and is filed under Candy Perfume Boy, Fragrance. You can follow any responses to this entry through the RSS 2.0 feed. You can skip to the end and leave a response. Pinging is currently not allowed.